"Sake is our baby. In a way, making koji is like having a newborn." 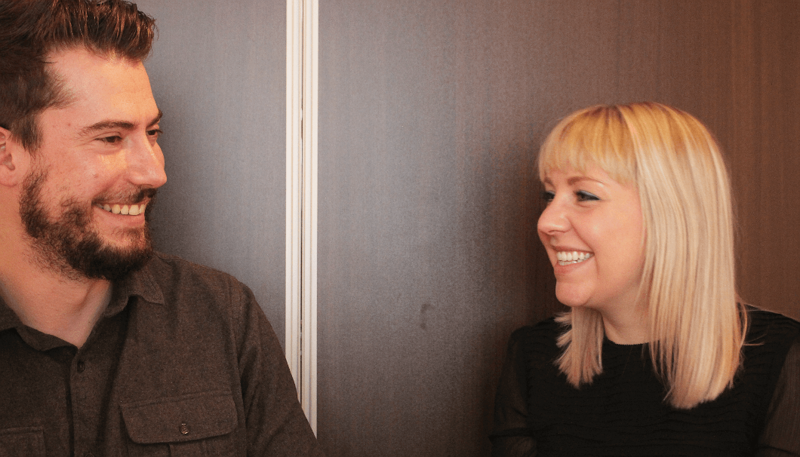 During their first trip to Japan three years ago, Lucy and Tom Wilson tasted sake from local breweries and fell in love with it. Inspired by the experience, they decided try brewing sake at their home in Peckham, a town in southeast London. 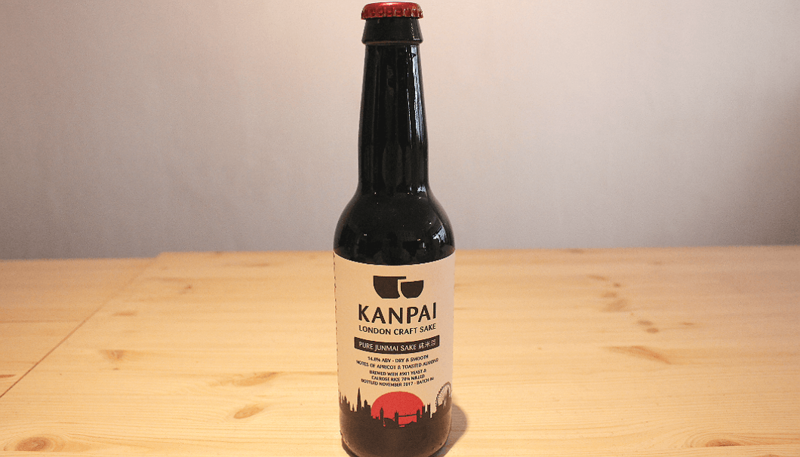 The name of the brewery is “Kanpai London Craft Sake“. The British have a long history of beer brewing, a tradition that continues with the popularity of craft beers and home-brewing today. Sake brewing, however, is something new. Tom had produced his own beer and fruit wine, so the Wilsons already had most of the tools for the job. With sake, they began experimenting with a variety of yeasts and techniques. They added better equipment, trying to improve their brew with each batch. The project grew until their home “became a brewery”. They had family and friends taste-test the results of these early attempts. Eventually, the reviews were good enough and it was time to move it out of the house. 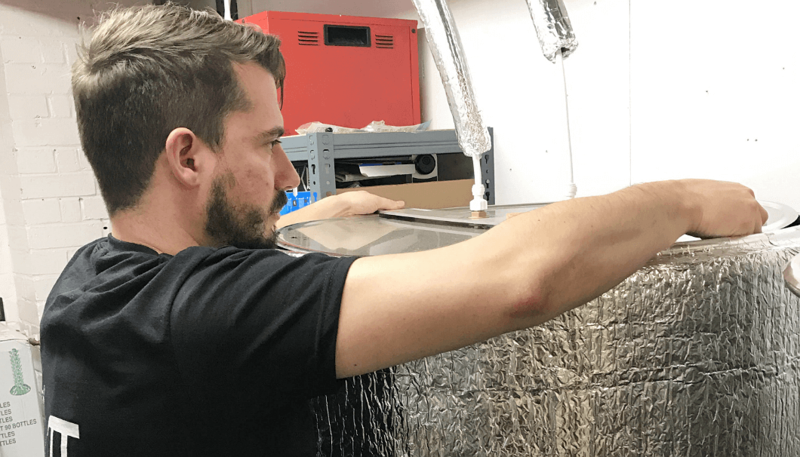 They moved the brewery to a nearby industrial unit in an old warehouse shared by other startups, including a recording studio, print shops, and another brewery making traditional mead. 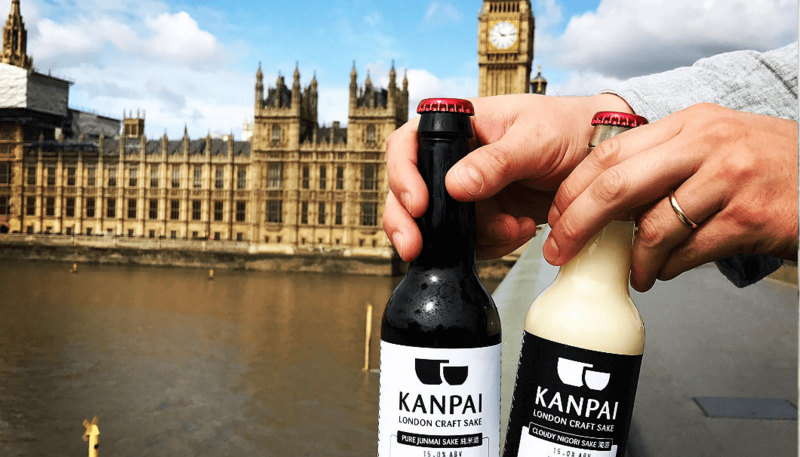 After that Kanpai was granted the UK’s first sake brewing license, and June of 2017 they launched their first official product at London’s posh Selfridges Department Store. Tom and Lucy say they’ve grown mostly through trial and error, using books and the internet as references, learning from their own mistakes, and developing their own unique style and taste. Their only formal training was the week of hands-on experience Tom spent at Gekkeikan’s sake brewery in Kyoto, a result of taking first prize in a cooking competition the company sponsored in London. 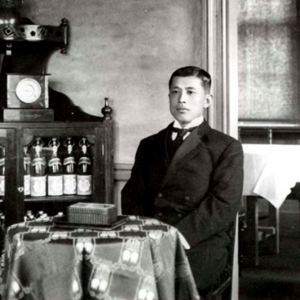 The UK is not a rice-growing country and sake rice is unavailable there, forcing the Wilsons to use sushi rice in their early brewing attempts. They now import Yamada Nishiki and Gohyakumangoku rice from Japan and calrose from California, and source traditional Japanese yeasts and koji from Japan to make their own koji rice. They took advice from the local craft beer brewing community and use regular London water, which is quite hard compared to that in Japan. “It’s best not to treat the water, to soften it or adjust the pH, which means adding chemicals. We want to avoid altering the water that way. It’s also very hard to replicate that process every time,” Tom explained. Instead, they physically filter and carbon filter the water before brewing. To promote the business, Kanpai seeks out press coverage, has an active Instagram account, and attends events where they can discuss their sake. In addition to sake tasting events, they promote Kanapi at events featuring fermented food, kombucha, cocktails — and even an photo exhibition featuring yakuza members! The Wilson’s dream is to educate Londoners about sake. The hot sake served at London’s Asian restaurants has left people with the impression that sake is a strong spirit like vodka. Tom thinks sherry is a better comparison. To counter the misconceptions, Kanpai is trying different ways to introduce sake to the public, such as cocktails and collaborations with craft brewers. And how about the sake itself? Kanpai sake is crisp and dry, a result of London’s hard water, which over-excites the yeast. To slow that process down, they brew it at a lower temperature. Their junmaishu is brewed at temperatures usually used in a ginjo or daiginjo sake. This means a very long fermentation period that leaves a very dry sake with no residual sugar. Dry sake is a good fit in U.K. establishments where drier drinks such as hopped IPAs, red wines, and gins are popular. Kanpai junmaishu also pairs well with spicy foods when chilled. Kanpai blends Japanese and British traditions by selling sake in craft beer bottles featuring a rising sun logo. 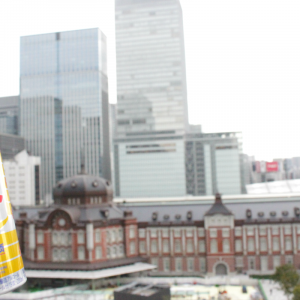 The 330ml bottles sell for £15 (about 2200 yen), making it affordable for two people to pour and share. A helpful note on the back warns customers that sake has a higher alcohol content than beer, and advises against guzzling the whole bottle alone. The Wilsons also want to make sake more accessible and increase their offering. They have already doubled the size of their brewery. 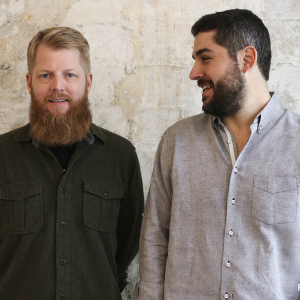 As production increases, Kanpai hopes to move to a larger space that would accommodate a tasting room where they could offer tastings, food pairings, and workshops. The ability to pour directly from the tank to the glass, rather than bottling, would also reduce costs and allow Kanpai to offer rotating guest sakes from Japan. 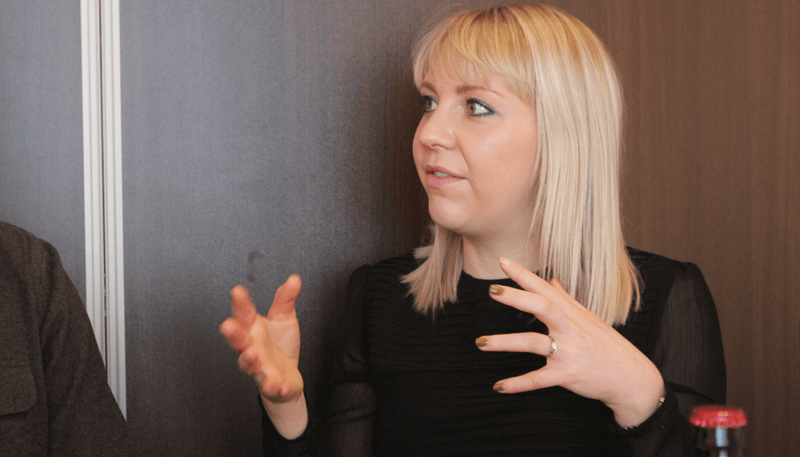 “We want to build a place where Londoners can really experience the diversity of sake,” says Lucy. Brewing is a risky business, and the couple haven’t given up their day jobs quite yet. But their evenings and weekends are completely devoted to brewing sake and building Kanpai as a brand. “Sake is our baby. In a way, making koji is like having a newborn,” Lucy jokes. 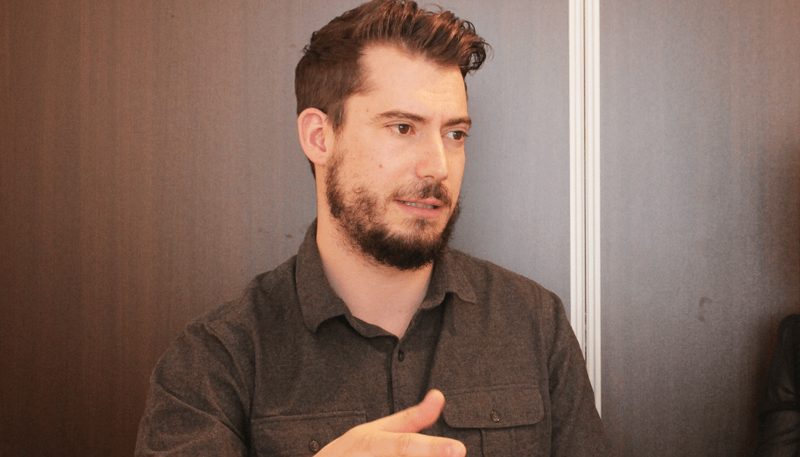 For now, Lucy and Tom are relying on the relationships they developed with the brewers on their many visits to Japan. Like the craft beer scene, sake has inspired a culture of sharing and mutual support. 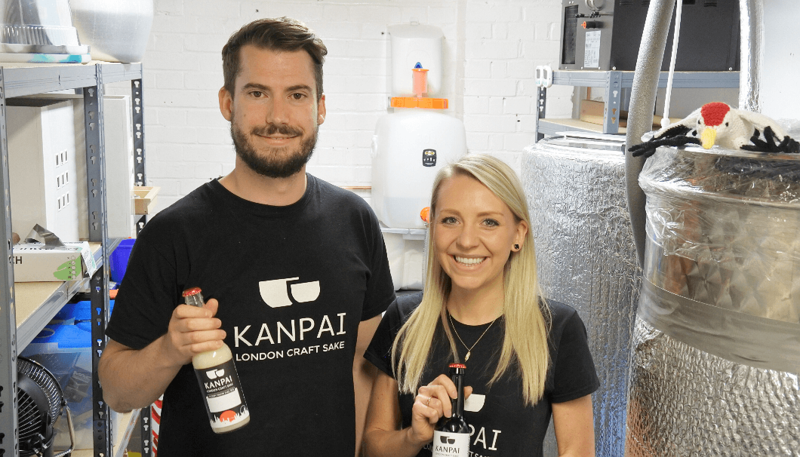 Kanpai is not just the U.K.’s first sake brewery, it’s a member of an enthusiastic community of sake brewers from around the world.